IKA PLANETRON® heavy-duty kneading machines are vertical kneading machines with two DUPLEX-like kneading blades. PLANETRON® kneading machines are always useful when high-viscous masses have to be kneaded intensively and with absolutely no chance of contamination. IKA PLANETRON® kneading machines produce, for example, dental masses, ceramic masses, plastic mixtures, pharmaceutical and cosmetic products as well as food products. 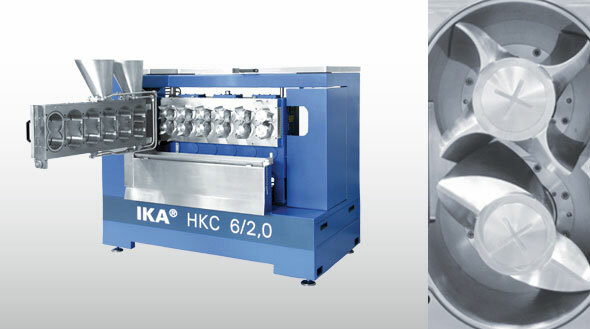 IKA’s heavy-duty HKD and HKS horizontal kneading machines are twin bowl kneading machines with horizontally arranged kneading shafts. These kneading machines are able to process mixtures with extremely high viscosities. This is why these kneading machines are particularly suitable for the production of rubber masses, plastic mixtures, ceramic masses, printing ink, carbon pastes, graphite mixtures etc. The CONTERNA is a continuously working multi-chamber kneading machine that is patented worldwide. The CONTERNA’s unique concept allows for shorter kneading periods and improved product quality when producing, for example, rubber master batches, plastics master batches, glues, hard metal masses, sealing masses, animal food, silicone rubber, and high-viscous food.